Thanks to many years of experience in the most diverse industrial sectors, we understand the need for safe, high availability of plant and machinery. It is the only way to guarantee the personal safety of employees and to meet the needs of the customer. Ultimately, it will also lead to the desired economic success. In order to face these challenges, you need time, specific expertise and the relevant capacity. Here you can benefit from our range of machinery safety services! 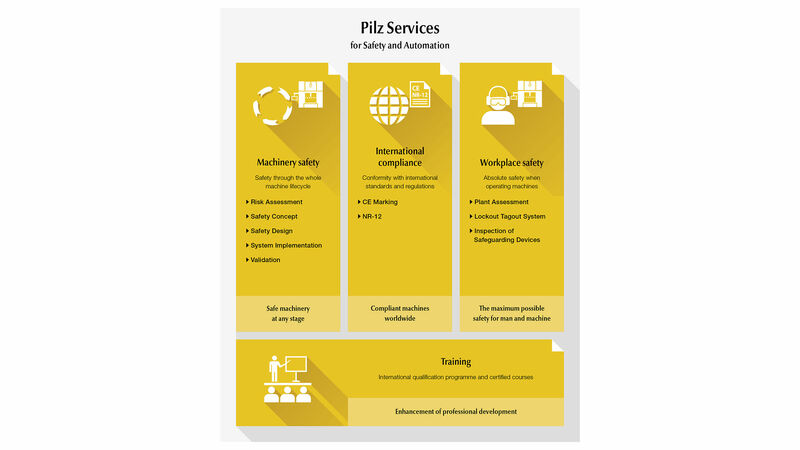 As a solution supplier, Pilz can help you to apply optimum safety strategies worldwide. Benefit from practical solutions to the most complex safety issues in all industry sectors. With our international team of committed employees, we're here to advise you. We can provide support during technical implementation with our services across the machine lifecycle – from risk assessment through to the declaration of conformity. Machinery safety is rightly a priority in modern businesses. Only well-qualified staff who receive regular in-service training are in a position to guarantee and promote machinery safety. We provide specific help in this respect by offering a comprehensive range of training courses on all topics of machinery safety and automation. Our service specialists provide increased safety for plant and machinery worldwide, in every industry sector. We offer practical solutions to meet your company's specific needs. We reduce the risk by developing and implementing tailor-made engineering solutions. As our customer, you will profit immensely from our precise knowledge of national regulations and standards. Our portfolio includes consulting and technical implementation in the field of machinery safety. We offer services across the machine lifecycle. Why not find out more, now! We have extensive experience in a wide range of industries. We understand your machinery and the applicable regulations and standards. As a result, we can provide support with tailor-made services for your industry.